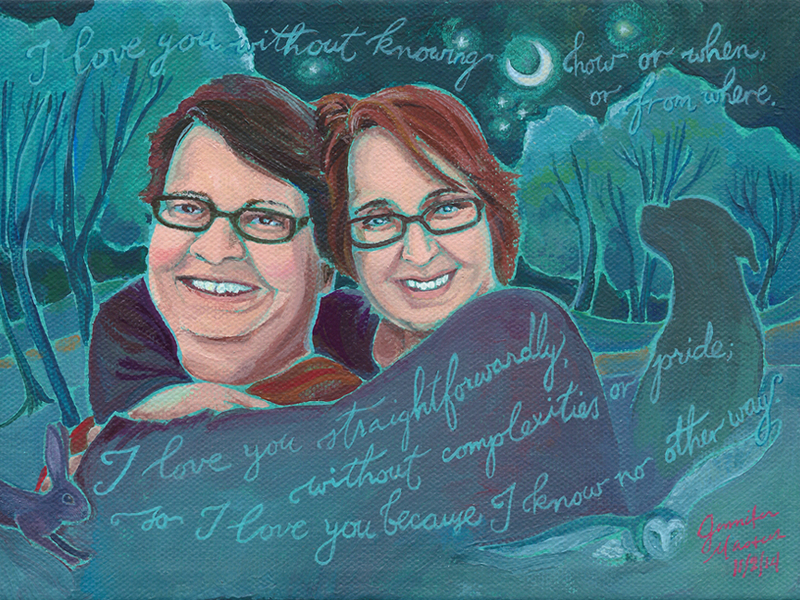 Our good friends Jo and Violet were getting married, and it was an occasion to celebrate! Not just celebrating the love of these two wonderful people, it was also celebrating the legalization and recognition of gay marriage, and it was the celebration of a community coming together that doesn’t come together as frequently these days, due to life and other circumstances ebbing and flowing in the ways they do. This was a celebration of Love that was a long time coming! It was just at the right moment … I had just completed another painting and had all my supplies out. It was four days before the big event, we didn’t have a gift yet. I no longer remember how I came across the Pablo Neruda poem, I was searching for something about love and marriage that wasn’t too saccharine, cheesy, or wordy. All the research and reference images I used are from their Facebook profiles. I had never met their dog Cinnamon, but being a dog person myself, I wanted to include her! All the other symbols spontaneously came from my intuition. The final touches had barely dried when I wrapped it!